Ah the 80’s. A time of bad hair-styles, synth music and action films – proper ones featuring actors that look like they could actually crack a skull wide open by just looking at one. The 80’s for me (and for a lot of people I would imagine) was where I first discovered my love for computer games. I lost count the hours spent in arcades, pumping 20p coins into the latest and greatest title to appear in front of my eyes in glorious 16-bit. This is where I imagine myself when I play Hotline Miami. The people who have played this top down 2D all out action video game you will know what I mean. Its retro graphics and music score hark back to these times when games where a purer concept then they are now. To put it in basic terms, this game is quite literally carnage! The game has around 20 or so chapters, each of which can be completed in a couple of minutes if you are experienced. Each chapter will begin the same, with you awaking in your apartment with a cryptic message left on your answering machine by an anonymous source. The message will tell you to go to a location and imply that you should massacre everybody there. You obviously don’t need any more persuasion than this to get involved in your very own blood bath do you? You scramble down the stairs to your car waiting for you on the street. Upon arrival you will be asked to select a mask to adorn for that mission. You will collect more and more masks along the way, all of which enable you with its own unique perks. This is a great little dynamic that the game features as many of the levels are designed to favour certain masks. Most of the time though, you will pick your favourite mask from the list just because it looks so damn cool. Fast paced action will ensue as soon as you go through the front door. Your actions have to be quick. The game is unforgiving. Any delay or mistake in your actions and you will invariably see the “you’re dead” sign float over the screen. You will see this a lot, and I mean A LOT! You’ll see this message a lot! The floors of each map are be littered with weapons, from baseball bats to shotguns. Your preferred style of play will dictate to some extent the weapons that you pick-up. For those that sway toward all out warfare, you’ll end up running to the largest gun so you can pull out your best impression of an American Soldier trying to spray and slay his target. If you are more inclined to a stealthier approach, melee weapons are preferable as they will not compromise your whereabouts to any nearby enemies. The game is fulfilling, regardless of which style you choose. You’ll be rewarded by each kill with a satisfying blood stain on all the nearby surfaces. You’ll finish each level with it looking like a scene out of a Tarantino film. The soundtrack is excellent. The musical score reminds me of the time when a games music could actually be listened to its own. The sounds effects are also excellent. Weapons give off a satisfying bang or thud each and every time they are used. 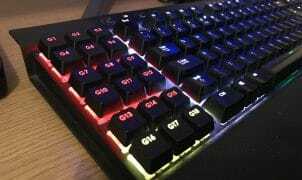 I only have a few gripes and they are personal and very minor. Some of the levels were slightly nausea inducing. These tended to be the drug fuelled ones where screen blur and the swaying motion of the camera made me feel like I was on a dodgy ride at a gypsy fairground. The Neon colours were also pretty harsh on the eyes if playing for any prolonged period. It is regularly available for pennies in Steam sales; purchase is a must for all those who crave a bit of nostalgia laden gore fest. 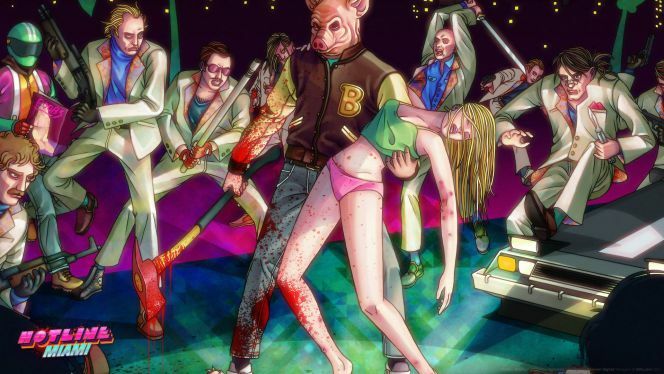 Hotline Miami 2: Wrong Number, the eagerly awaited sequel to the original is scheduled early this year. Check out the Steam Store page which has some great preview videos and screen shots to wet fans appetites. I for one cannot wait! 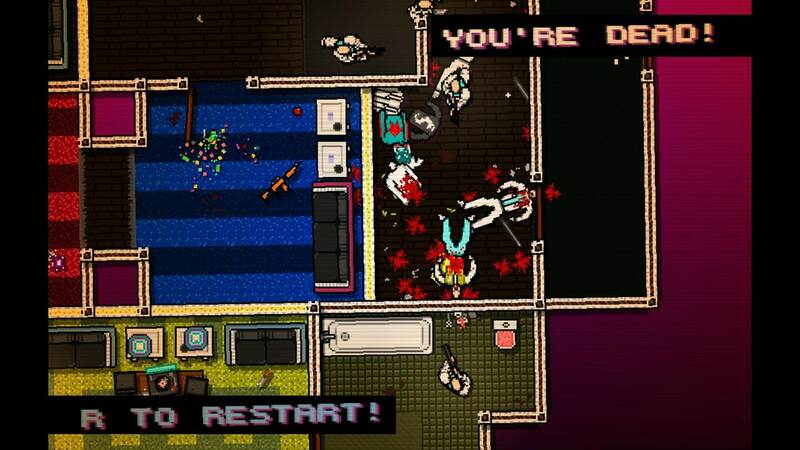 Hotline Miami is frustratingly addictive. It’s been out for a fair while now and in that time I have completed it numerous times, each time with the hope that I will improve upon my time. It will keep most people entertained for an hour or so before they put it back down. I regularly find myself coming back to the game when I need to unwind.It’s great for letting off a bit of steam.